Greater Los Angeles is home to dozens of coin shops, from small family-run places to huge bullion dealers. Said to be the largest market for rare coins in the world, coin shops here tend to specialize in older U.S. coins whose value is based on rarity, rather than precious metal bullion valued at the current spot price of gold or silver. With reputation so important in this industry, the most reputable coin dealers have been in Los Angeles for decades, and are known for providing top-grade coins at competitive prices. In California, sales tax applies to coin and bullion sold as collector’s items or as an investment. Bulk sales of coins and bullion of at least $1,500 are exempt from the tax. Within Los Angeles County, the sales tax rate is 8.75%, so be sure to keep this in mind when buying coins from a local dealer, and consider buying in bulk to avoid the tax. 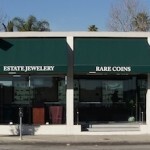 Coin Connection in Pasadena is among the best places to buy silver in Los Angeles. The shop specializes in government issue silver coins and bullion, buys and sells gold bullion, and also offers a range of rare and historical coins. The shop is set up for serious collectors; but there are also many browsing opportunities for those who just want to see what is available. If you’re looking for a rare coin, selling one, or considering precious metal bullion investment, this small, reputable coin shop has a knowledgeable staff available to assist you. 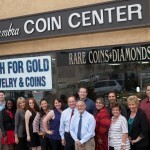 Specialists in numismatic coins and precious metals, Alhambra Coin Center is one of LA’s top silver dealers. If you’re looking for a local dealer of high-grade rare coins, pay a visit to Alhambra. One of the largest coin dealers in the Los Angeles area, Alhambra carries coins and bullion in a wide range of prices, welcoming beginning collectors and experienced investors alike. More than strictly a coin shop, in addition to bullion and rare coins, Alhambra Coin Center also deals in luxury items such as designer apparel, jewelry and watches, fine art, and antiques. Founded in 1979 as Hobby Investments, Collectors Internet is one of the largest and oldest brokers of quality coins in the Los Angeles area. In the heart of Los Angeles, Collectors Internet can supply most coins, from items worth less than a dollar to building a multimillion-dollar collection. They specialize in early U.S. coins, and are currently buying more than $100,000 worth of rare coins every month to keep up with the growing demand. Individual coins and wholesale bulk lots are sold both in store and online, including through eBay. The store itself is not an ideal setup for browsing, but if you know exactly what you’re after – or see something on their website and want to take a closer look before making your decision – this is a great spot for buying silver in LA.